Gate Post Lamps can give the entrance to your property (whether it’s a single residence or an entire gated community) an impressive look to guarantee to add value in the eyes of the beholder. Curb appeal is a very real commodity in the world of real estate and commercial buildings. 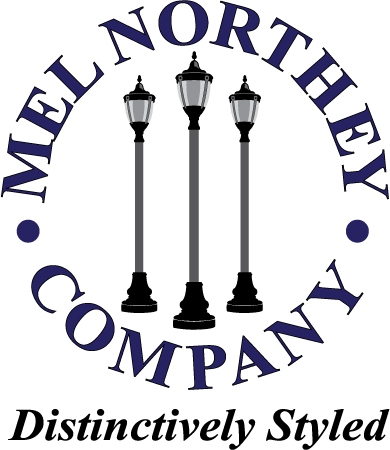 Why not make the most of your “front door” with Gate Post Lamps from Mel Northey Company. When it comes to lighting solutions, architects, builders, contractors, developers and municipal planners have been turning to us for decades. 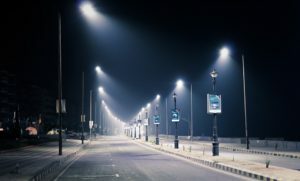 This happens generation after generation because building professionals have come to count on us for only the best in exterior lighting plans from Gate Post Lamps to street signage and commercial architectural enhancements. You might think of our products as the ‘little black dress’ of lighting options. The classic lines and timeless beauty of our Gate Post Lamps and other street and sidewalk lighting solutions, will keep them beautiful and in fashion for generations to come. Our product provides unsurpassed quality and gives you the satisfaction of classic beauty as well as significant savings in both the short and long term. 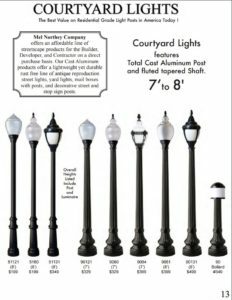 Because our cast aluminum antique replica Street lamps, traffic signs, Gate Post Lamps, sconces and every other component part of a well-done lighting plan comes with cutting-edge manufacture and finishing, we know that you will save money on maintenance for the life of the units you purchase. Additionally, we pay special attention to the design of lighting products including Gate Post Lamps so that they are in compliance with Dark Sky standards. What is Dark Sky technology? It’s very simple. Lighting fixtures of the past were poorly designed. Bad design make it possible for much of the fixture’s light to escape into the night – literally. A good portion of the light meant to illuminate sidewalks, walkways, and streets went beaming into space. This leaked light from Gate Post Lamps and other lighting fixtures makes stargazing in the Texas night sky difficult or even impossible. These days at Mel Northey Company, we want every unit that leaves our facility to be “smart” enough to keep the light on the ground where it belongs. We know that not just sky-watchers suffer when there is too much lost “up-light.” Nocturnal birds and animals also suffer when they are unsure of their surroundings because of blinding, unnatural light from Gate Post Lamps. It follows that you can save money when you train the light you purchase on the ground. Because none of it is wasted by sending it soaring into space, you can create safer and more secure streets, sidewalks and parking lots and Gate Post Lamps using less electric power. Your savings also translate to a greener Texas because it simply takes fewer resources to produce less light. Your carbon footprint shrinks as if by magic thanks to Dark Sky compliant Gate Post Lamps. Order a brochure today to use in planning your next landscape or streetscape planning project. You will see immediately why building and planning professionals count on Mel Northey for the best in brilliant lighting solutions. And you just might see a Gate Post lamp you like. Call Today 281-445-3485. You can fill out a Contact Form Here or simply send us our team an Email Here! Below is our location.